Joe Hill looks exactly like his father, Stephen King. Joe’s wearing a bushy beard at the moment, but we’ve seen Stephen with the scruff too. Joe is also hilarious, so maybe he should have a career in comedy. At least for now he uses his macabre humor in books like NOS4A2. 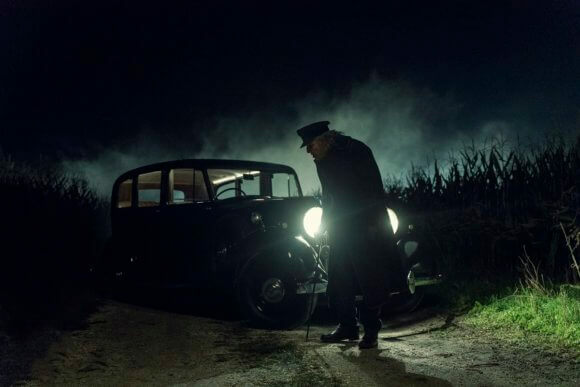 NOS4A2 is coming to television courtesy of executive producer Jami O’Brien. Zachary Quinto plays Hill’s vampire Charlie Manx, and young Vic McQueen (Ashleigh Cummings) is discovering her psychic powers. 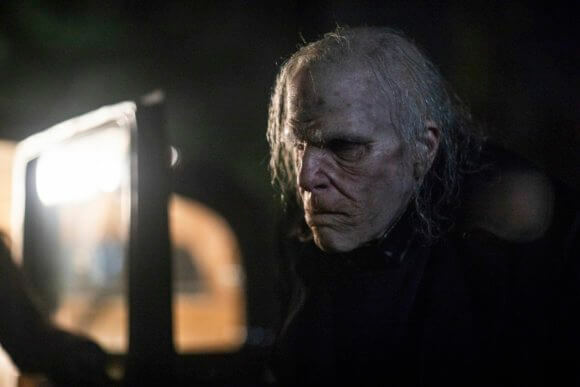 NOS4A2 will premiere June 2, 2019 on AMC and Hill and O’Brien gave a press conference at WonderCon to preview the series adaptation. Were there any visual images you had in your mind you wanted to keep from the book? Jami O’Brien: “The bridge is miraculous, I think. So that was probably the biggest challenge for production to make sure that we got right. It’s interesting, the bridge is actually, there were three pieces of the bridge that are practical and a lot of it, the interior of it, which this is a testament to our VFX team, is VFX. I was like, ‘You guys aren’t gonna get any props for this because no one’s going to know because that’s how good it is.’ That’s why I’m telling you all. What made you to do a TV series vs. a movie? Joe Hill: “Well, I think you respond to who’s got the passion. Who connects with the material and feels like they can do something exciting. So in some ways, the format is almost secondary. I do think that we’re living in this really remarkable period of television and genre television. Are you in the writers room with Jami? What was the process of bringing Charlie from paper to screen? Did you want it to be more of a sense of dread than jump scares? Joe Hill: “For myself, I’m not above a good jump scare. I think there’s plenty of room for that but they are kind of cheap and weak. If someone drops a stack of frying pans behind you, you’re like, ‘Agh!’ But that’s not great horror. That’s just a loud noise. Will there be any deviations from the book? Jami O’Brien: “I’ll speak to that a little bit. I think that where I started from when I set out to adapt this book is a place of loving the book. So my process, just in terms of thinking about it and how we thought about it in the writers room, has always been how can we tell this story and get as much of the book actually into our show as we can? Will we get to see Christmasland? How protective were you of these words? Joe Hill: “Well, I don’t know that I have to be protective of the words. If NOS4A2 comes out, is a huge hit, everyone loves it, it won’t make a single word of my book better. If someone takes a story and makes a bad film out of it, it won’t really make a single word of my book worse. I told my version of this story and one of the reasons I tried not to be too much underfoot with Jami is this is her version of the story. How much of the novel does season one cover? So three seasons at least? What was Jami’s take on Joe’s take on vampire mythology? Joe Hill: “I kind of hate mustache-twirling villains. I really believe that everyone views themselves as the hero of their own story. I do think in a weird twisted way, you could look at the decisions Charlie has made and see how he would view himself because in his mind, he’s rescuing children from lives of suffering and unhappiness. And then as he takes them to Christmasland, he gradually drains all their hate and regret and sorrow and grief. All that comes out of them and when Charlie is done with them, there’s nothing left but happiness, innocence and teeth. Any plans for additional books? Would you suggest someone read the book first? Are there others like Charlie? Jami O’Brien: “I don’t think that either Vic or Charlie would consider the other one their nemesis. I think that they are both people who have extraordinary gifts that come with costs. And their gifts ultimately put them in conflict. But just from a character standpoint, I don’t think Charlie Manx thinks that Vic McQueen is his nemesis. I think he thinks that she is intriguing and potentially dangerous. Is there a meaning to all the overhead shots? Jami O’Brien: “That was thanks to our director, Kari Scogland, and our director of photography for that episode, Martin Algren. I love those overhead shots because I really think that it sets a mood and gives us a sense of New England.